Hands On Bike: Part 7: Cheap Bikes vs Premium Bikes: What is the Difference? Part 7: Cheap Bikes vs Premium Bikes: What is the Difference? Before I continue with the article, I would like to thank all my readers, some of whom have given me valuable feedback and compliments. Without all your continued support and encouragement, I would not have found the inspiration and drive to write all these articles on my blog. Thank you! The Drivetrain! It is the heart of the bicycle, without which the bicycle is just a Flintstone-style vehicle. The drivetrain is the system that transmits the power from the rider to the bicycle, powering you forward. A good drivetrain will be very efficient, using almost 100% of the rider's input to drive the bicycle forward. It is not possible to be 100% efficient, because energy losses are unavoidable. However, we can try to minimise the energy loss with good engineering. Let us first take a look at what the drivetrain of the modern bicycle consists of. Now for the comparison! I don't have complete information on the Aleoca R2R's drivetrain, so I will give it my best shot at guessing the parts, and give it the benefit of the doubt. Hope it does not affect the credibility of the comparison too much! The bottom bracket, also commonly known as the BB, is the core of the drivetrain. For the square taper BB used for both the Aleoca R2R and the Dahon MuP8, the BB has bearings at either end of the BB, together with the square taper axle. The square taper BB has been around for a long time, and is still very commonly used nowadays. It is also cheap, and nowadays people don't service square taper BB's. When it wears out, it is much easier to just change out the BB. The BB screws into the bottom bracket shell on the frame of the bike. Point to take note is the direction of the screw thread used. To loosen the BB from the frame, the BB cups have to be turned in the pedalling direction. This helps to prevent the BB cups from tightening further during pedalling, which will make it impossible to remove in the future. The BB cups will have a left-hand thread on the right side, and right-hand thread on the left side. Confusing? Cartridge-type BB on top, Loose bearing type at the bottom. Note the difference in the number of parts! The excellent picture above shows the difference between a cartridge-type BB and a loose bearing BB. The cartridge-type is non-serviceable, you just replace the whole unit when it is broken. Both the BB's are square taper BB. When mounted on the bike you cannot really tell the difference. The difference is in the construction. The Aleoca R2R uses an older type of square taper BB, with loose bearings (kept together with a ball bearing retainer) that can be serviced. This is the same stock BB used on the Dahon Vitesse D7. The disadvantage is that it is not as well sealed against dirt and water as the sealed bearing type. Since BBs are rarely serviced nowadays, there is hardly any advantage to be able to service the bearings. Just change the BB! The Dahon MuP8's square taper BB is the newer type, with sealed bearings that come from the factory almost fully assembled. You just need to screw in the cartridge from the right side, and then insert the left side BB cup. Cartridge type refers to the construction, where the BB comes as a cartridge that you can just change out as a single unit. This type of BB is better sealed against the elements, thus it should be more durable. Comparing these 2 BB's, there is frankly not much difference here. Cost savings are made here since it cannot be seen by the user anyway. Performance wise there isn't much that can go wrong here, even cheap BB's will perform decently. The cranks link the pedal to the chainring, which in turn pulls the chain and drive the rear wheel. 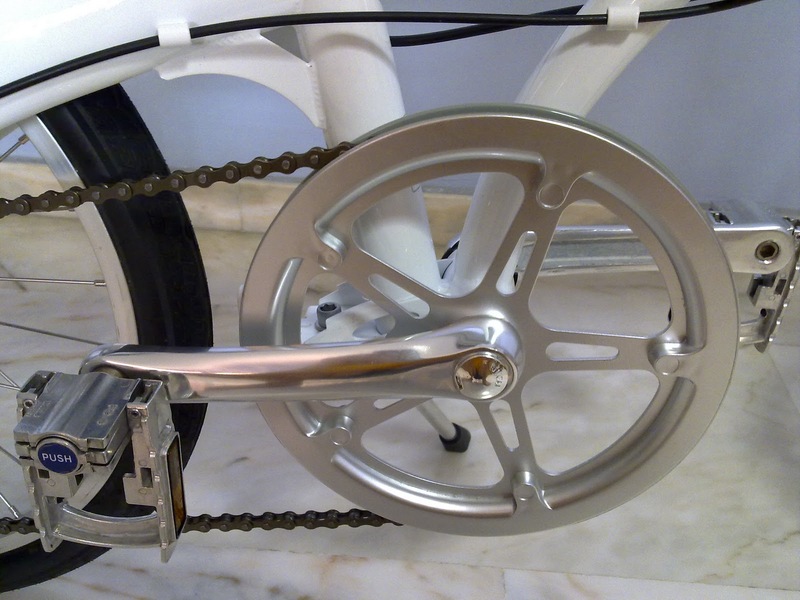 To be efficient, the cranks have to be very stiff to endure the high forces that the rider exerts on the drivetrain. The ultimate crank would be super stiff and ultra lightweight. Carbon cranks come close, but at a high price! Nowadays, cranks are mostly made out of aluminium, because it is relatively lightweight and strong. Cranks that come attached with chainring. Similar to the type found on Aleoca R2R. Kinetix Supra crank. Note the 5-bolt chainring mounting and the beautiful surface finish! Aluminium cranks are always cold-forged for strength, which is especially important for cranks. It would be very "exciting" and dangerous if your crank were to snap while pedalling hard! The main difference here is the way in which the chainring attaches to the right-side crank. For the Aleoca R2R crank, the chainring is permanently press-fitted onto the crank with a splined interface. Good system, just that you cannot change out your chainring if it wears out or if you want a chainring with different number of teeth. 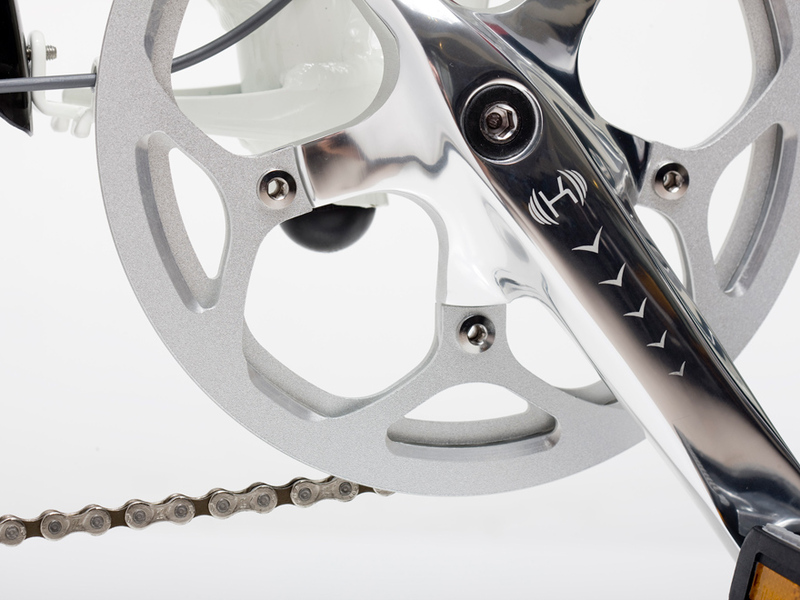 The Kinetix Supra crank uses the 5-bolt mounting with 130mm bolt circle diameter (BCD). This is a pretty standard mounting for most road bike cranksets nowadays, which means that you are free to change your chainring as you please. What stands out here is the polished surface finish of the Kinetix Supra crank! Really beautiful finish that greatly elevates the aesthetic value of the cranks. The chainring drives the chain, and by varying the number of teeth on the chainring, you can alter your gear ratio. Some strong riders like to change their chainring from the standard 52T chainring to a larger 56T or even 60T chainring to compensate for the smaller wheel size of the 20" bikes. Since there is no front shifting for these two bikes, there is no need to get highly engineered chainrings (with ramps and pins and profiled gear teeth for optimum front shifting) used for bikes with double or triple chainrings. Typical aluminium chainring with 130 BCD mounting. Main difference here is the material! A steel chainring is very durable, but it is heavy and may be prone to rust after some time. Aluminium chainrings are the norm nowadays, being light and strong. 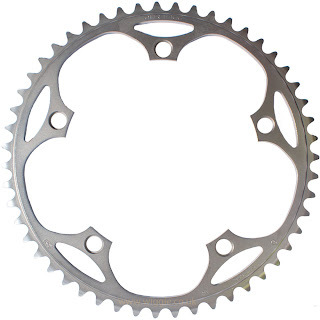 A chainring can always be replaced if it wears out, which is possible only if the standard 5-bolt mounting, such as those found on the Kinetix Supra crank is used. With the 5-bolt mounting, the mounting points of the chainring onto the crank is much closer to the edge of the chainring. This reduces the likelihood that the chainring will be bent during transportation or usage, as the chainring is better supported by the crank spider. This contrasts with the one-piece crank+chainring set found on the Aleoca R2R, where warping of the chainring is much more common. Not much to compare here, pretty standard chains used for the bikes! A nicer chain would usually be nickel or chrome plated for better appearance and corrosion resistance. 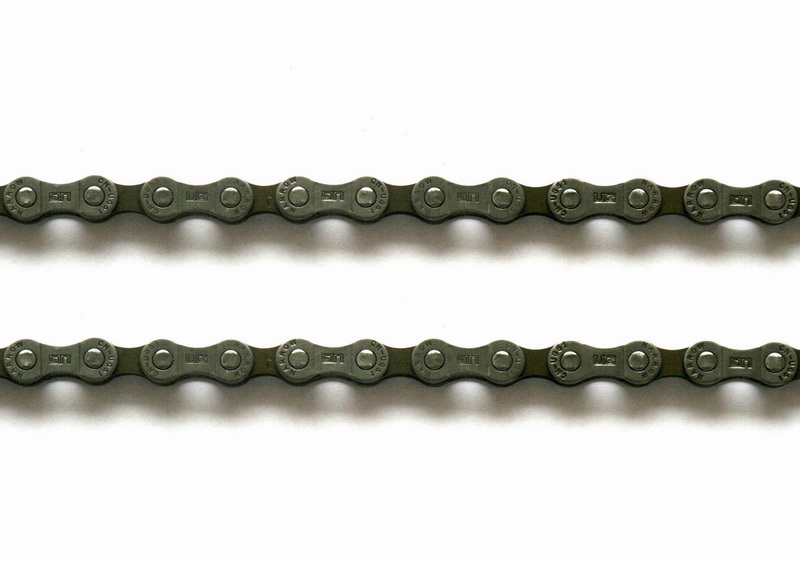 The most important aspect is not the surface finish of the chain, but how you take care of the chain. As long as you remember to clean and lubricate the chain regularly, even the dull looking cheap chains will run nice and smooth. Typical bike chain. Dull surface finish. 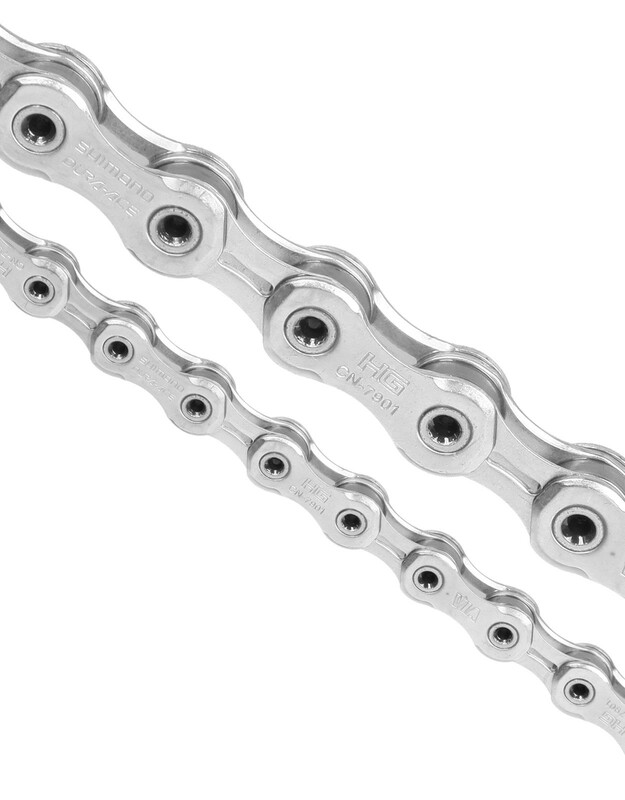 Dura-Ace 10 speed chain with durable zinc-alloy silver finish for corrosion resistance. In the previous post of the bike comparision article, which is Part 6: Gear Shifting System, I mentioned that the recommended chain for an 8 speed system should be an 8 speed chain. 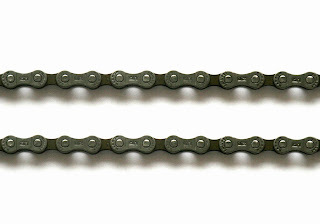 (6,7,8 speed chains are the same). However, you can also use a 9 speed chain on an 8 speed system with not much of a problem. 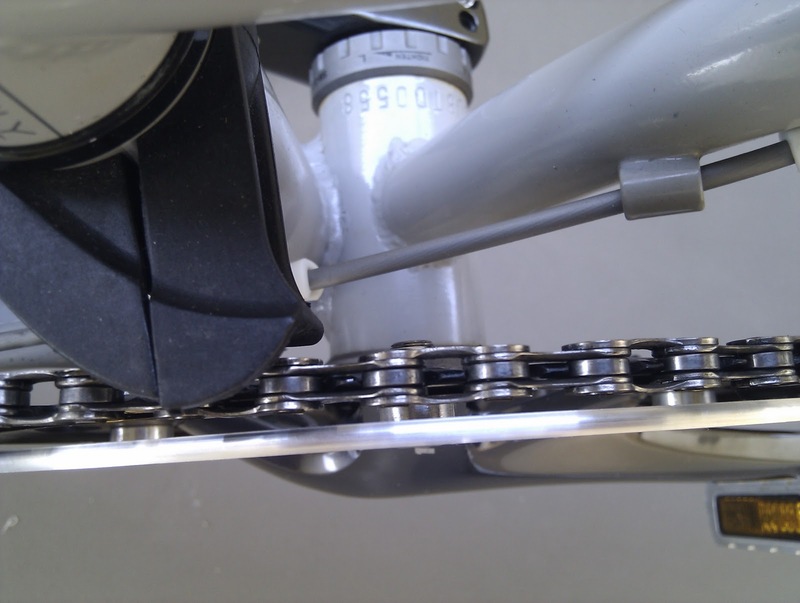 Being narrower, the 9 speed chain should run quieter, as it is less likely to rub on adjacent sprockets, especially when cross-chaining. The compromise here is the gear shifting, where it might be hesitant to downshift (change to lower gear), as the chain is narrower and will not climb as well onto the larger sprockets. But it is usually not a big issue. Just don't use an 8 speed chain on a 9 speed drivetrain, as the wider 8 speed chain will be too wide to fit properly on the narrower 9 speed sprockets! In the previous part, the cassette sprockets were discussed when the gear shifting systems were compared. The sprockets are also part of the drivetrain, as the sprockets drive the freehub, which then turn the rear wheel. This will not be discussed further as it has already been compared in Part 6: Gear Shifting System. Other little parts that complement the drivetrain would be the chainguard and the bashguard. The chainguard and bashguard are commonly mis-labelled, with the bashguard also being called the chainguard. Strictly speaking, the chainguard is the little black tab that wraps around the seat tube, which helps to prevent the chain from falling inward off the chainring. The bashguard is the large disc that encircles the chainring, preventing the chain from falling to the outside of the chainring. With these, the chain will stay on the chainring, and not fall off when shifting too quickly or riding over bumpy terrain. 2-Piece plastic bashguard. Sandwiches the chainring to prevent chaindrop. Black chainguard and edge of bashguard shown. Together, they prevent chaindrop. The very stylish bashguard that was on my Boardwalk! It has since been removed as I have added a front derailleur (FD), and the FD will prevent chaindrop. An alloy bashguard would be more durable and resistant to damage compared to plastic bashguards. But performance wise, there is no difference here. It does not contribute to drivetrain efficiency, although it may improve the appearance! 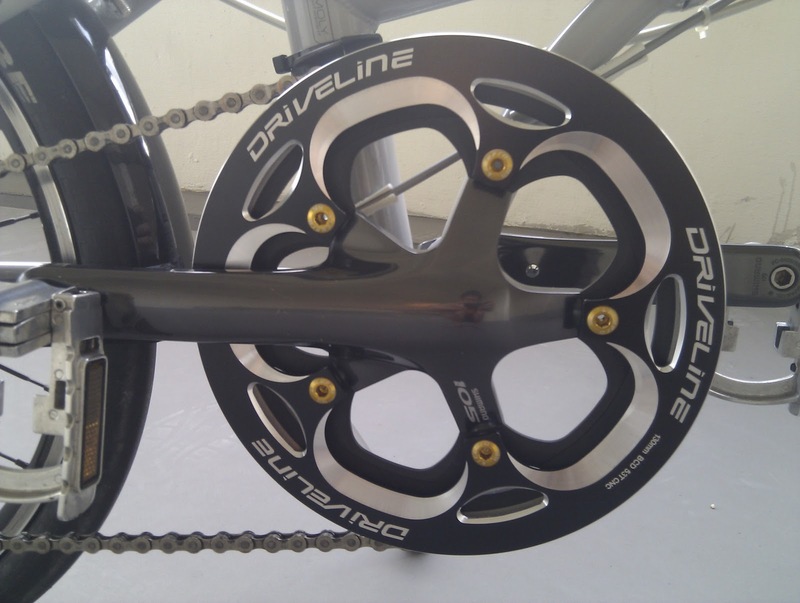 Comparing the drivetrains, the significant differences are the cranks and also the chainring. Other than that, the other components are quite similar. I would have expected the Dahon MuP8 to have a better BB, such as a Shimano Octalink BB (stiffer and more efficient). However, this would mean upgrading the crankset too, which I guess is not possible if they need to keep the production costs down. One good thing is that the Dahon MuP8 frame is a good frame, thus it is worth upgrading the drivetrain to a Shimano Hollowtech II drivetrain. The Hollowtech II drivetrain is much stiffer and also lighter at the same time, making the drivetrain more efficient as less energy is lost to the flexing of the BB axle and also the cranks. You can read the other parts of the article at the links below! Cheap Bikes vs Premium Bikes: What is the Difference? In the next and last part of this article, other less well-defined aspects of the bikes will be discussed and compared. Examples would be the folding joints that are used on the bike, and the Pre-Delivery Inspection (PDI) conducted by the bike shop before selling the bike to the consumer. Check out Part 8 here! if i'm looking for speed, which 1 should 1 upgrade 1st? which of the 3 is the most costly? and value for $ if i can only afford for one of the 3? If want to go faster, cheapest and best way is to upgrade your legs! But seriously, upgrading BB is not going to help much. getting a bigger chainring helps only if you are already maxing out the highest gear. if not even if got higher gear, but legs not strong enough to push the higher gear also no point. Getting more speeds help if it gives you more gears for better cadence control. Upgrading to more speeds is definitely expensive, need to change many components. Good way to increase speed is to use slim slick tires, or a better wheelset. Getting stiffer cranks such as Shimano Hollowtech II cranksets will help. Hi Steve... been following ur upgrading blog for some time. I must say u r really good at this and also "poisoning" others to an extent. Just kidding... LOL! I have a 16" Dahon Arc D7 sitting at home (courtesy of my Dad bringing back from China). Are all Dahon's D7 models spec-ed the same? Done a couple of PCN rides and have since swapped out the stock brakes and saddle. I am planning to upgrade to 9 speed drivetrain with Dahon Neo RD. You mentioned that ultimately the most important item is the shifter and the RD can handle a switch from 7-9 speed, yes? Can you give some enlightenment here? ps. Also, where did u purchase the Driveline bashguard? Dun think any LBS carries this in SG. If I'm not wrong, the Arc D7 is the 16" curve with a 7 speed derailleur system. This model is not available internationally I think, only in China. There are mainly 2 categories, the international category which you can see from the Dahon website, and the China Domestic models which you can see from the Dahon China website. To upgrade the Arc D7 to 9 speeds, the first thing you need is a new wheelset. The rear hub you currently have can only support 7 speeds. A better and more common rear hub will support 8/9/10 speeds. This will not be cheap. In the event that you do change the wheelset, you will need a 9 speed Shimano rear shifter, 9 speed cassette and 9 speed chain. The RD can technically be used for 9 speeds as I have tried that before, although you cannot expect the performance to be very good. You can get the Driveline bashguard from Taobao.com. Or get from Taiwan bike shops in person. Or try www.thecyclopedia.com. Hey Steve... I'm so totally lost now. Unable to find a 16" BSD 305 size wheelset. :( Any advice / recommendations? hey steve, where do i get the dahon mu p8 chainguard and bash guard? thanks. please read my comment above for more info, thanks! BTW, I thought another reason for the Bash Guard was to protect the Chainring teeth if it meets with a big rock or the inadvertent steps? yeah that is another reason. but only applied for MTB going off road. Cool post. Question, does that Driveline bash guard fit the original factory Dahon chain ring? depends on which crank you talking about. 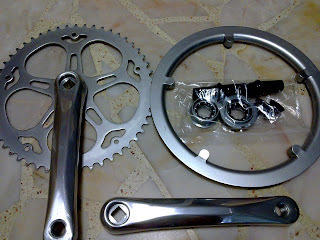 if it is the crank with the chainring fixed to the crankarm, such as the D7 series, then no it will not fit. It will fit those with standard 130mm BCD crankarms, such as those found on the P8 or P9 bikes. Thanks. I have the 2012 Dahon Mariner and it looks the same as your original Dahon MuP8. Are you willing to sell yours? Mines broke in half and it seems like it is not covered by the warranty. Thank you for your help. I just bought a bike with 9 speed. I will use it to ride with my friends that is riding road bike. Hence the workshop recommend me to change from the 53T chainring to 58T chainring. What is the pro and cons? Changing to a larger chainring will enable a higher top speed, but only if you are strong enough to push the top gear. Are you already using the highest gear (Front 53T and rear 11T) and spinning fast? If not, it will not help you if you are not strong enough to use the higher gear. Thanks for sharing! Can you advise which shimano crank arms & BB to use for my birdy(classic) model? The current BB is square taper BB, with ridea chain ring(130BCD) & 5 spider arms. I'm thinking to change it to hallow tech BB. Looking at Shimano 105, not sure what are the things I should look for. Not too familiar with Birdy frame geometry, but I expect it to have some limitations due to clearance required during folding, similar to the Brompton. Shimano 105 should fit, just need to pair with a road Hollowtech II bb. You can check with E walker about the upgrade. Busch & Muller IXON IQ Front Light Review!